If you have many PowerPoint presentations on their PC and need to search through them to find specific slides and pieces of information, you'll welcome Slideboxx ($119, 30-day free trial). This browser-based application indexes your presentations and lets you search through them with lightning speed. It displays the results as slide thumbnails, so you can quickly find what you're looking for. Slideboxx lets you easily find PowerPoint presentations and slides, and create new presentations out of them. Finding slides is just the starting point for what you can do with Slideboxx. Once you've found what you want, you can drag the slides to a presentation pane and build new presentations from existing slides. If you often re-use slides in different presentations, you'll find it a tremendous time-saver. If you've got a lot of files and presentations on your PC, be prepared to wait when you first install the program, because it takes a long time to find them and index them. But it's well worth the wait, and you can always run Slideboxx in the background, while you perform other tasks. 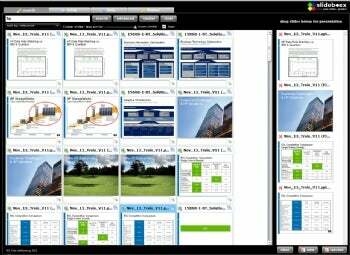 Version 2.0 of Slideboxx offers some significant benefits over the previous version. For example, it can hide similar slides, reducing clutter. You can also tag slides, making it easy to find the exact slide you want. The program has also benefited from tweaks to the overall interface, such as adding autocomplete to the search box, and easier ways to organize slides. At over $100, Slideboxx isn't cheap. If you only rarely re-use slides and presentations, it's overkill. But if you live and die by presentations, and often re-use material you've previously created, you'll find it very useful.